Bridgetown, Barbados, September 21, 2013 – The Caribbean is even closer to fostering an entrepreneurial spirit among the region's young people through CIBC FirstCaribbean International Bank's renewal of its partnership with a regional youth entrepreneurship organisation. CIBC FirstCaribbean and the Caribbean Centre of Excellence of Youth Entrepreneurship (CEYE) recently entered into a new Memorandum of Understanding (MOU) to continue their successful strategic partnership. The MOU solidifies the bank's commitment to work with the CEYE on entrepreneurial development to inspire creativity and innovation, build independence, create jobs and generate wealth. The project targets young males and females and ultimately seeks to improve their livelihoods and the future for Caribbean youth. 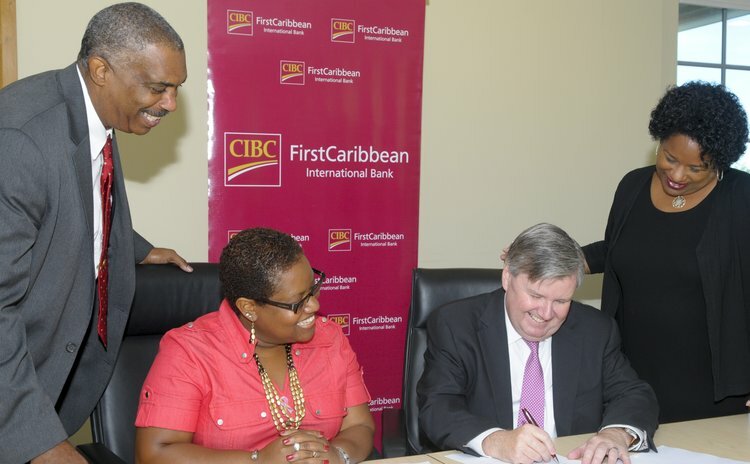 CIBC FirstCaribbean is making available grant funding of USD $200,000.00 over the two years of the partnership. In addition Youth Business Trusts/Youth Entrepreneurship Organisations will receive USD $120,000.00. The funds will be used to help start up new youth entrepreneurship organisations (YEO) in the Bahamas and St. Kitts and Nevis, as well as, for the first time, support an already existing YEO in St. Vincent and the Grenadines. The funding will also be used to continue ongoing development of the youth entrepreneurship programmes in Antigua, Barbados, St. Lucia, St. Vincent and the Grenadines, Dominica, Trinidad and Tobago, and Jamaica. Additionally, the CEYE will also use part of the funds for capacity development, quality control, and monitoring and evaluation. The CEYE evolved out increasing requests from CARICOM countries for help from the Barbados Youth Business Trust. Managing Director, Marcia Brandon in thanking the bank said, "We are extremely grateful to CIBC FirstCaribbean for their vision and commitment to regional sustainable development, which is what continuing this well-needed partnership contributes to. The bank's partnership is not only long term but very high impact." She added, "CIBC FirstCaribbean recognises that a strategic approach to corporate social responsibility brings sustainability, but sustainability does not happen overnight, hence their willingness to stay in for the long haul." In terms of outcomes, Ms. Brandon said that over the past six years the CEYE and its partners in youth entrepreneurship had been able to expose over 3,000 youth to entrepreneurship, start-up approximately 75 young males and females in a range of businesses, and expose 35 young entrepreneurs to access to markets and trade missions. Chief Executive Officer of CIBC FirstCaribbean, Rik Parkhill, said the bank's renewal of its partnership with the CEYE was testament to its keen interest in the entrepreneurial development of the region's young people. "We continue to be deeply committed to sustainable social and economic development initiatives which have the potential to transform the lives of the region's youth." He added that the importance of entrepreneurship to the continued development of the Caribbean economy and recovery from a recession could not be overemphasized. The MOU is the third between CIBC FirstCaribbean and the CEYE.